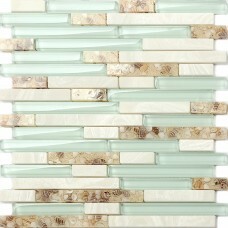 We name this tile "Ocean Waves". 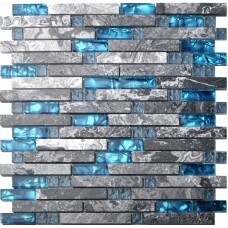 It is interlocking design with blue crystal glass and grey Nature Stone. The color of the stone chips is random, some chips looks grey and some chips are darker, because they are all made from nature stone, we keep their nature color, did not add any artificial dyer, and we only polish the surface of the stone to make it glossy. The blue glass chips look like the diamond "Heart of Ocean". 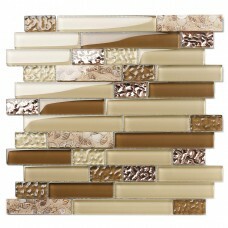 This tile is very beautiful for kitchen backsplash, accent walls, bath and shower walls. Each of the tile is in 12''x12''. We have two options for customers. One option is 11 sheets per box( covering 11 sq.feet). The other is 5 sheets per box ( covering 5 sq. feet). We use UPS ground service to ship tiles which takes 3-6 business days for delivery. · Sheet Size: 12''x12''; Chips size: 1''x 4''; Thickness: 8 mm. 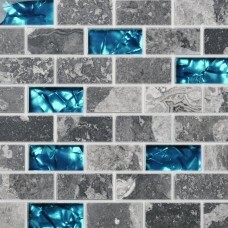 · High-temperature glasses ensure color will never fade away, adding man-made stone chips. · Sample size is 4x12 inches. Sample cost is $ 9.9. Shipping cost is $ 10.00. · Samples will be shipped via USPS which takes 5-7 business days for delivery. · Here is the link for a sample. Order a sample. 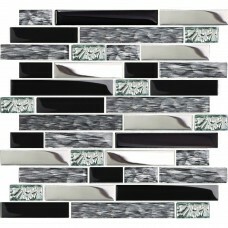 · Tiles will be shipped out in 1-2 business days, and it usually takes 1-6 business days for UPS ground delivery.